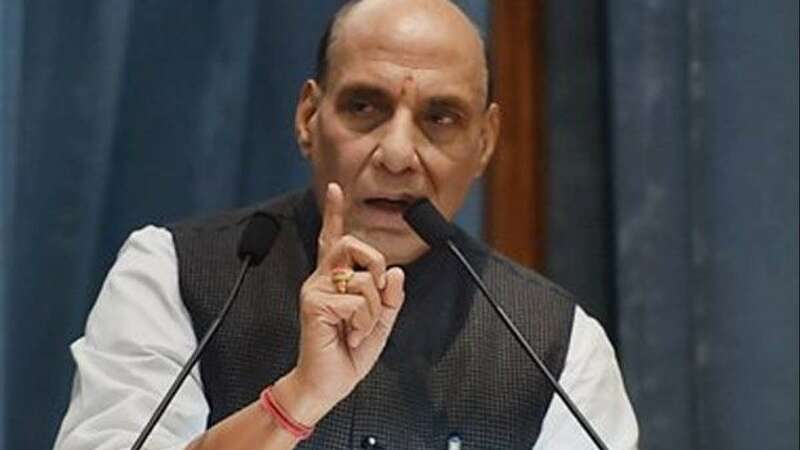 New Delhi : Inaugurating the 'Young Scientists' Conclave Rajnath Singh, Union Minister for Home Affairs, highlighted the vital contributions of Indian Scientists. Making copious references to Physicists like Fritjof Capra, Carl Sagan and Heisenberg, he said that Heisenberg, by his own admission, got the idea of the famous uncertainty principle while talking to Rabindranath Tagore. While talking about scientific development in India, he said that he aims for India to be a 'Vishv Guru' rather than a 'super power' as it will be enlightening rather than being intimidating. Scientific temper should be cultivated without disrupting cultural ethos, he added. He proposed an addition to the popular slogan of 'Jai Jawan, Jai Kisan, Jai Vigyan', the term 'Jan Vigyan' that is science for the masses. He said that awareness about e-commerce must be spread to achieve the same. During the sessions on 14 themes, 162 oral and about 1350 poster- presentations will be made in the course of 4 days. Speaking on the occasion, Dr. Harsh Vardhan, Union Minister for Science & Technology as well as Earth Sciences, said that in terms of growth and research India is progressing by leaps and bounds, and the department and the PM stand rock solid behind these endeavours. Earlier in the day, India International Science Festival (IISF)-2016, jointly organized by Ministry of Science and Technology and Ministry of Earth Sciences in collaboration with Vijnana Bharti (VIBHA) elevated to a new level, with the inauguration of International Science Film Festival (ISFF) and Young Scientists' Conclave on National Physical Laboratory (NPL) Campus. Dr. D.K. Aswal, Director, NPL welcomed the participants. Prof. Ashutosh Sharma, Secretary, Department of Science & Technology, said that he was happy as a good number of films came from young students. Ofir Akunis, Minister for S & T as well as Space of Israel was happy that India and Israel are celebrating the achievements in field of Science and Technology. He said that open mindedness and the courage to challenge establish notions is essential to the out-of-the box solutions. He said that every astronaut began his dream as a child filled with curiosity. He averred that India and Israel are two ancient nations with one great future. The Ambassador of Israel, Daniel Carmon, said that the relationship between India and Israel is growing more and more meaningful with each passing day. He exhorted the students to dream big as dreaming will propel them to towards translating dreams into reality. Union Minister for Science &Technology, and Earth Sciences, Dr. Harsh Vardhan termed this a unique activity and lauded the efforts of Vigyan Prasar and CSIR institutions in organising this mega show. In a lighter vein during his speech, frequently interrupted by loud clapping of the audience, he mentioned his love for films and said that he looked forward to watching films during the festival. He hoped the students learn something new every minute at IISF 2016. He mentioned that in becoming the PM of India Narendra Modi had the support especially of the young, many of whom were not even voters. He termed the students 'young aspirational minds of the nation'. During the inaugural session, two films dealing with space science and other frontier areas, from film makers of Israel were also screened. This was followed by a film Devasthal by Aryabhatt Research Institute for Observational Sciences, introducing the prestigious 3.5 metres telescope, the biggest in Asia commissioned. Dr. Gopi Chandran, director, Vigyan Prasar, and Dr. Manoj Patairiya, Director, NISCAIR were also present on the occasion. A Plenary Session on Agriculture and inauguration of the Start-up India were other highlights of day second.